Medicare Supplement Plan B is one of the lowest cost plans on the market. If you are struggling to get by on a fixed income then the question might be in your mind “How will I afford emergency medical costs with all the fees Medicare doesn’t pay for?” To the answers to this and any Medicare questions you might have, we can answer for you if you call us at 844-528-8688 or compare rates on our easy quote tool on this page. Please continue reading for more information on Medicare Supplement Plan B. One easy answer to the above question, Medicare supplemental insurance is the answer. Also known as Medigap, this medical insurance program is delivered by private insurance companies to minimize your out-of-pocket expenses. Recipients of basic Medicare sometimes have to pay high fees in the form of deductibles, co-payments, or coinsurance. However, Medicare Supplement Plan B, covers many of these expenses to provide you peace of mind. When it comes to Medicare, terms can get confusing. Medicare Supplement Plan B is completely different from Medicare Part B.
Medicare Part B is one piece of your Original Medicare. It covers regular medical care, such as annual physicals and sick appointments. Medigap Plan B is one of ten supplemental insurance plans that add on to your Original Medicare benefits. It is paid for separately from Medicare Part B and 100% optional..
Who Is Medicare Supplement Plan B Best For? 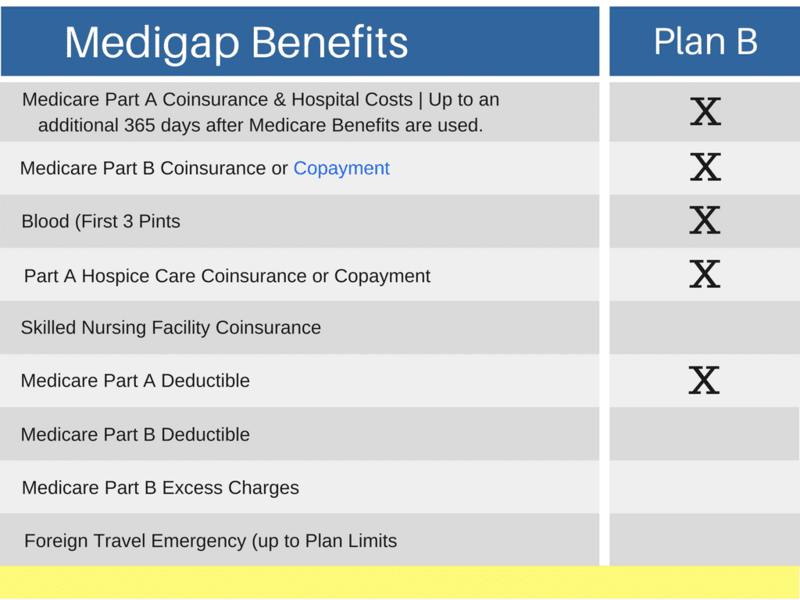 Plan B is almost identical to Medigap Plan A except for one important piece of additional coverage. While Plan A offers a good minimum level of protection, Medicare Supplement Plan B expands the coverage by also covering 100% of the Part A deductible. For 2018, this is $1,340 per benefit period. That’s more than a thousand dollars that you may need to cover out-of-pocket for hospital or other inpatient services. And that’s not just an annual deductible. A benefit period ends when you have not required covered services for 60 days straight. This means you might end up needing to meet the deductible multiple times in one year. Furthermore, in order to qualify for Medigap insurance you can NOT be also enrolled in a Medicare Advantage Plan (Part C). Ready to Enroll in Medicare Supplement Plan B? If you are looking for low premiums but still the peace of mind to know that you won’t need to meet hefty deductibles, Medicare Supplement Plan B might be the plan for you. Give us a call at 844-528-8688 or fill out our easy contact form and we’ll be happy to help you expand your Medicare coverage today.